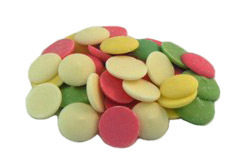 These pastel discs are a non-chocolate vegetable-based coating and therefore safe for those with cocoa allergies. They melt extremely well and are ideal for baking or decorating. Comes packaged in a half pound bag with an assortment of yellow, white, pink, and green wafers.